Photo by Ben Moffat and Ben Moffat | The State Press Larry Ehrhardt poses for a portrait on Friday, March 11, 2016, at Ehrhardt's Schwinn in Tempe. 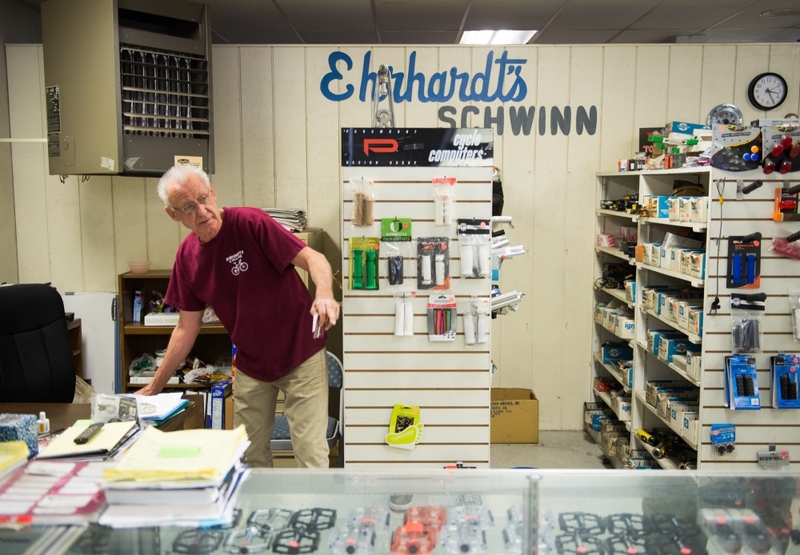 Ehrhardt is retiring and closing his bike shop after 59 years. 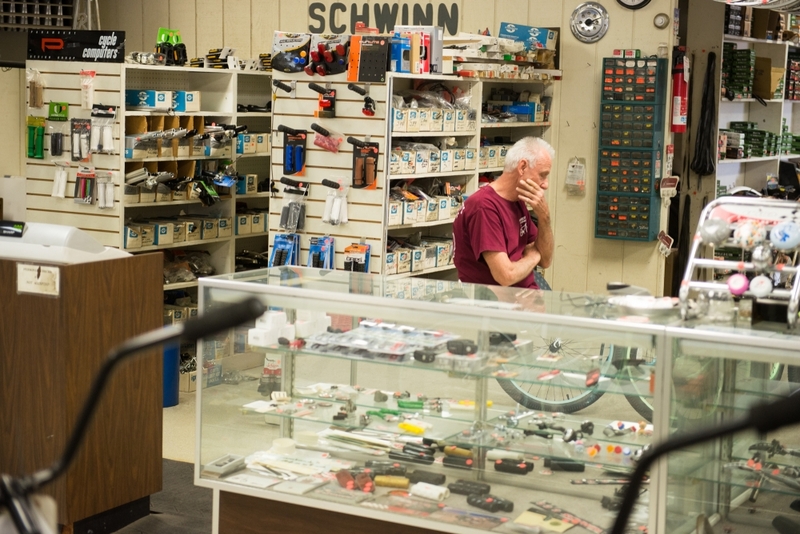 Larry Ehrhardt’s store, Ehrhardt’s Schwinn, has been selling bikes in downtown Tempe since 1958, when his father, John, founded it as Ehrhardt’s Toys, Home and Auto Supply. He said he started working there when he was 11. “I’ve never worked for anybody else or ever had another job,” Ehrhardt said. He and his wife, Kathy Ehrhardt, have run the store together since Larry’s father died in 1966, operating it with Larry’s brother, Keith, until they bought him out 12 years later. Larry and Kathy were next-door neighbors as children and graduated from the nearby Tempe High School a year apart, he in 1964 and she in 1965. This year, Kathy said, they will celebrate their 50th wedding anniversary. Since then, the store has remained a family affair. The Ehrhardts' daughter helps out from time to time, and their granddaughters worked there while they attended ASU. Ehrhardt said he quit fixing bikes 30 years ago because he has more fun as a full-time salesman. He employs mechanics to do the shop’s repair work behind the counter. “The adrenaline’s still pumping when I sell a new bike,” he said. Ehrhardt only stocks three types of bikes: beach cruisers, mountain bikes and fixed-gear bikes, or “fixies.” He said the students who make up the bulk of his clientele need something cheap and reliable to get around campus, which is why he doesn’t bother with high-end carbon-fiber racing bikes or classic steel road bikes. 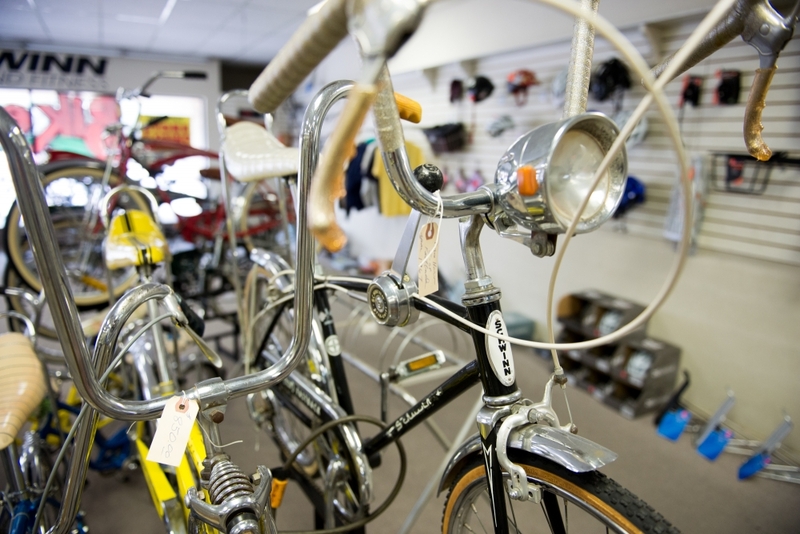 The store sells used bikes, which tend to be aimed toward ASU students. He said he doesn’t sell new road bikes or BMX bikes anymore because he can’t compete with the prices of what he called the “throwaway culture” of Wal-Mart and other big-box department stores. "We're still old-school here," he said. "We did it like we did years ago. 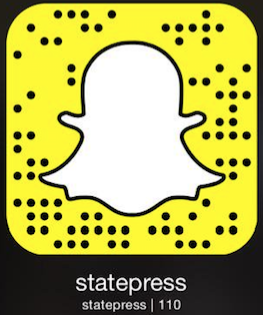 With students, they're all looking for something less expensive that works good." 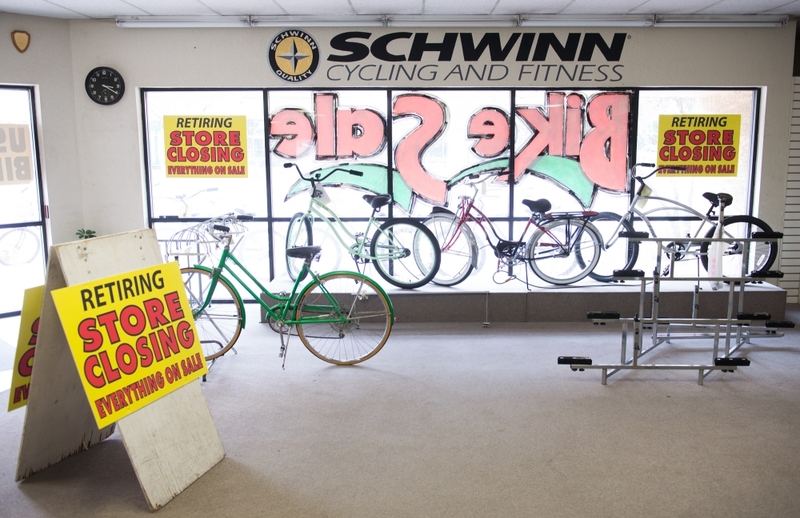 However, he does keep a small display of old, collectible Schwinn bikes near the middle of the shop floor. He has some cruisers and a tandem, but most of them are Sting-Rays, the iconic cruiser-style bike with small wheels, high handlebars and long “banana” saddles. One, a collectible black five-speed, stick-shift model from 1967, was listed at $1,400. Others, more permanent parts of his collection, are simply not for sale. "All the years I've been in business and seen different fads come and go, the Sting-Ray was the one model of bike that took off so fast," he said. "Within weeks after they introduced it, it was the hottest bike in the country, and it stayed that way for about 10 years." At one point, he said, he had about 40 — one of every model. The one-room shop is open and spacious. Before Ehrhardt announced his retirement and began liquidating his stock, racks of new mountain bikes and fixies lined the west wall, while accessories like handlebar lights and locks occupied the east wall. The area around Ehrhardt’s desk, in the back corner behind the counter, contains most of the store’s personal touches. Wall decorations include old newspaper clippings, family photos and a framed poster that reads: “The only thing more overrated than natural childbirth, is the joy of owning your own business.” Open boxes of Frosted Flakes and microwave popcorn are on a small bookshelf. Kathy said she is looking forward to life after the business. Kathy said they were looking forward to being able to travel and see the rest of Arizona without having to come back to Tempe and reopen the store every Monday morning. She said her husband will need some time to get used to retirement. Robin Bowden, long-time customer, said she’ll miss Ehrhardt and his store. Bowden said she first came to Ehrhardt’s Schwinn 20 years ago, in March 1996, to see if they could save a “trashed” mountain bike. Bowden said she feels comfortable at the store and knows Ehrhardt has the expertise she needs. She said sometimes she even comes in just to chat. “He’s kind of like a father to me,” she said. The store is in the process of selling off its current inventory. Ehrhardt said he expects the store to be open for about six to eight weeks. The shop floor, once lined with rows of cruisers and fixies, is now largely empty. Talk radio, piped in from speakers in the ceiling, fills the space instead. It blends with the soft sound of the small TV, complete with rabbit ear antennas, aimed at Ehrhardt’s desk. Red discount stickers dot most of the remaining merchandise, including staples like bikes, saddles and locks, but also hats, stickers, iPhone cases and other odds and ends. Despite what his wife says, Ehrhardt said he’s looking forward to retirement. Biking: How safe is it?